I was asked a question in an older post the other day, but had no way to really answer the question so that the person could see it, as it was posted as a comment on someone else's comment. Since no email was given and it was a good question (And seriously, I need to post something! New employee begins soon, so let's hope I can get some time to write.) so I figured I'd answer it on the blog as a post. Question: I am having a terrible time trying to move the quilt for fmq. I have used a quilt top with thin cotton batting (mistake)and minky on the back. I am using machingers gloves. I have tried with feed dogs both up and down, but it won't budge. I would be so grateful for any suggestions. So first, let's flesh out this scenario a little bit. She posted on a post I did about using Minky for the back, so let's address this first. I don't have a ton of experience with this fickle material, but some brands work great and others are flimsy and the fuzz almost clings to the sewing machine's bed and table surface. Some almost demand a ball point needle because they are stretchy. Most of the time a universal needle will do the trick. The minky side of a baby quilt I did. She is smart to mention that the thin batting might be a mistake. A thin batting can lead to the machine eating the quilt. This can be mitigated by using a single hole (or straight stitch) needle plate, a new needle, and sometimes the above mentioned ball point needle (which might not work well with a woven cotton top, especially batiks). A thin batting might also lead to a top that wrinkles or bunches as you move it. A thicker batting (I love an 80/20 blend of cotton/poly) tends to be easier to move across the surface of your work space. 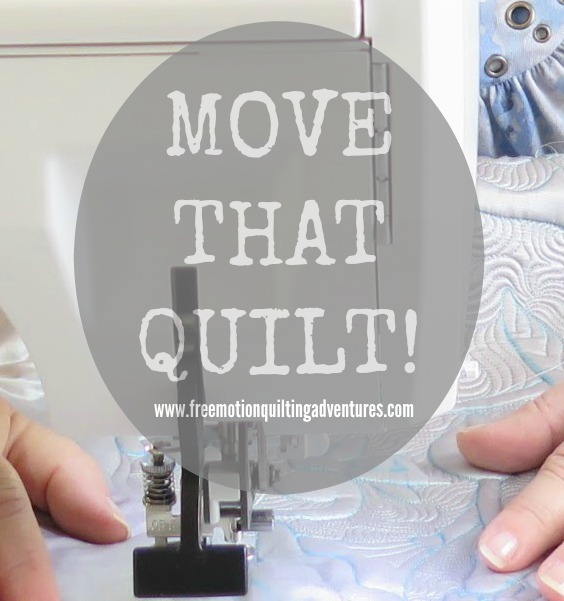 Speaking of the surface of your workspace, if you haven't read it before or are new to free motion quilting, you might want to check out one of my popular articles on how to set yourself up for success with free motion quilting. She didn't mention using a Sew Slip or other Teflon-like material to help smooth out the surface, but I highly recommend one. I wish I had more clarification on this person's project! But until I do, the part about feed dogs up/down and it won't budge has me wondering. Since she mentioned Machinger's gloves I can assume that she knows that she'll be moving the quilt herself. It leads me to wondering about the foot she is using. So, first one would need a free motion foot. I figure she knows this, but it never hurts to mention it. A free motion foot or darning foot is made to allow free movement of the top under the foot, instead of holding it down against the feed dogs so they will feed the fabric through. A free motion foot made for a high shank machine would certainly press the quilt against the feed dogs or bed of the machine if used on a low shank machine. So one would want to make sure this isn't the issue. The most common type of free motion foot is the spring loaded hopping foot. This foot hold the fabric down while the needle is in the fabric. This type of foot takes a certain level of speed before it's hopping fast enough to allow free motion of the top. Go too slow and it's a very jerky motion and you can hear the needle 'ting' as it comes out of the fabric. With a non-hopping foot, there's an adjustment for height. If it's set too low, it's going to hold the quilt in place. When using a hopping or non-hopping foot and you feel like you've adjusted it to the best of your ability, and it's the right one, and yet it's too low (or even too high) take a look on your machine for a presser foot pressure adjustment. This isn't a feature on some of your modern, lower end models, but many vintage machines and mid- to high end machines usually have this feature. reducing the pressure can have a tiny effect like raising the foot, while increasing the pressure is much like lowering the foot. Also, raising or lowering the feed dogs actually has an effect on the space between the machine bed (or feed dogs if up) and the foot. This in effect is like lowering or raising the foot height. Since there is absolutely no relation between the tension systems and the feed dogs (other than feed dog timing in regular sewing (like when the fabric puckers) which looks like a tension issue, but isn't), I suspect that those who like to keep the feed dogs up are actually decreasing the space between machine bed and foot. Having too much space between machine bed and foot can cause stitch formation issues, which can be mistaken for tension issues. This is because the fabric is 'flagging' up the needle and messing with the top thread as it forms a loop for the machine hook to grab and form the stitch. I do drop my feed dogs when I quilt, but I know plenty of quilters don't. Do what works for you. But if you leave the feed dogs up, make sure that they are covered if you can't set the stitch length all the way to 0. Otherwise, those feed dogs will fight you. Not all machines will let you set the stitch length all the way to 0. Finally, how you place the quilt can impact how well you can move it. Unless you are working on a small table topper or placemats, do not lay your quilt out flat. Do not roll it into a log either. Logs are heavy and flat quilts are too. In either method, you end up moving the whole quilt. That's pretty hard on the hands, especially as you move, drawing designs essentially with your finger tips. Instead, use the 'puddling' technique, also known as smoosh and stuff, or 'hills and valleys'. You only need the area around the needle, between your hands, flat. The hills and valleys act as hinges for the quilt to move, leaving the bulk of the quilt beyond a valley or two to stay still. I only move the area right around the needle! 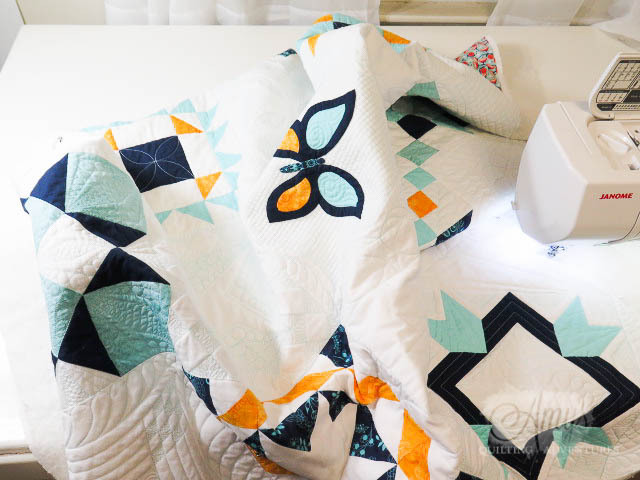 You may have seen these free motion quilting suspension systems that are on the market, as well as the DIY versions that some quilters have rigged up. They can be useful for creating essentially the 'hills' allowing support for the weight of the rest of the quilt. So that's about all I can come up with on moving the quilt given the information I was given. I hope the person asking finds some answers (feel free to comment again so we can get more clarification) and that the rest of you find some value in it as well. As always, leave me a comment, like, share and all that other jazz if you've enjoyed this post. Hearing what you think helps me to provide you with better information. Good advice, as always, Amy. Even if you had to guess at the circumstances, you covered a lot of territory of fmq. Can't wait until you get some free time to write more. I miss you. Another great article! Thanks for the tips especially the puddling technique. You have helped me so much. Thank you Amy. I'm getting ready to do fmq for the first time. Your helpful article came at just the right time. Thank you! If a person didn't have either of those feet, a spring NEEdLE can help. I free am learning free motion , have sewed nearly 70 years, what is a spring needle, not foot.? Total new language for me? Amy what a wonderful and thought out article. So many helpful hints and reminders for all of us. Thanks for all you do to keep us informed. Wow, I love the way you thoroughly covered the possibilities without making a lot of assumptions! You reminded me of some things I would not have thought of and I learned a few others. Great post! 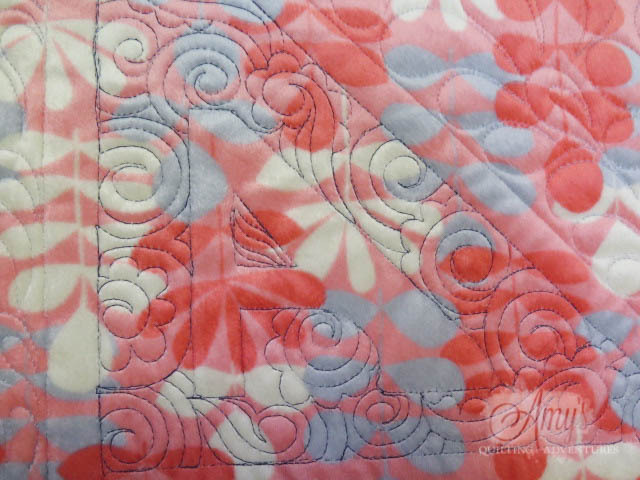 Not only are you great at FMQ, but you write these quilting posts with a great deal of talent. I think minky would be difficult to use on the back of a quilt for FMQ. I haven`t done it, but I would probably chose a design that I could use my walking foot.